Being an Anglican that does not an Anglican church where I live, I try to use any opportunity I have to worship in Anglican churches where I travel. The last such opportunity was a few weeks ago in Nicosia, Cyprus (and, by the way, I will have the opportunity to worship there again next Sunday). During the liturgy, I was somewhat intrigued by one of the (very) British hymns sang (at the end of the service I realised that my colleagues were as intrigued as I was). It was the hymn ‘Teach Me, My God and King’, written by George Herbert, a 17th century composer. What attracted our attention, besides the quite strange tune, were the lyrics, especially the strange alchemist analogy of Christ being the ‘philosopher’s stone’ – the one that, supposedly, turns everything into gold, in the last stanza. Maybe that is why the hymn was called originally ‘The Elixir’. So, I have decided to share it with you when I get home, which I do now. Listen first to the song, and then you may read a short exegesis of this hymn. George Herbert (1593–1633) is one of Anglicanism’s mystical theologians that people in the pews have come to know and love through his poems that have become familiar hymns. Their evocative power has enabled generations of worshippers to bridge the worlds of earth and heaven through a sensitivity that sees the extraordinary in the ordinary. His poem Teach me My God and King epitomises this. The paradox of mystery and revelation, transcendent and imminent, is beyond comprehension yet it ‘is revealed through those images which can contain the truth of both states at once.’ This mystical component and the literary quality in the works of Herbert, and other Caroline divines, had a converting influence on TS Eliot, as it has on countless others. In Teach Me, My God and King, Herbert sees avarice succinctly expressing the paradox of money, which becomes the drudge when we elevate it into sovereignty, stamp our image on it and worship it. Inevitably, people who behave like that fall into the ditch, because of the blindness that results when we refuse to look on the real world of God, but persist in following our own corruptible sin. The poem is entitled The Elixir, a word meaning a remedy that comes from the ancient science of alchemy (that preceded chemistry). This is a kind of preparation capable of changing metals into gold, or that is able to prolong life indefinitely, a supposed remedy for all ills. So it is the wonder drug. A fuller term elixir vitae, ‘elixir of life’, was given to the substance that would indefinitely prolong life, a liquid that was believed to be allied with the philosopher’s stone. What is this remedy that will make all the difference to the life of the Christian. It the ability to see that all things in the daily routine of life may indeed turn to gold and change their meaning if they are directed to God in willed intention. The whole of life can be lifted out of the psychological into the spiritual sphere. Keep looking in this direction and all will be turned to gold. So our prayer is, Teach me, my God and King, In all things thee to see, And what I do in any thing, To do it as for thee. 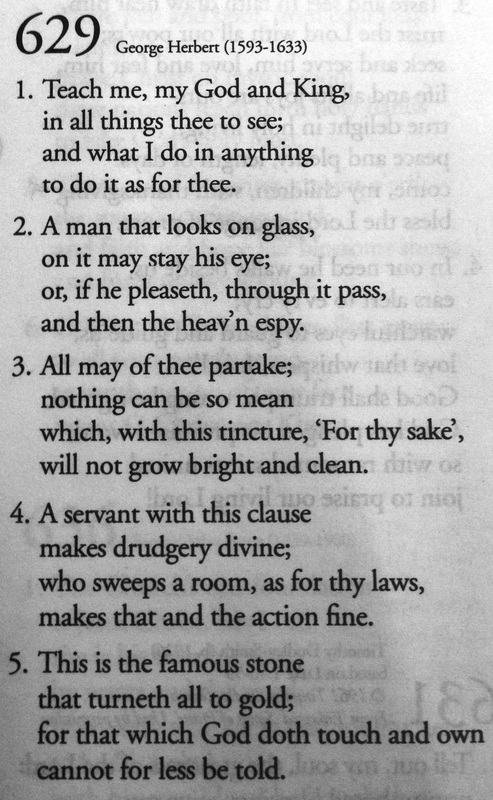 This strict attention to God is essential if the soul is to thrive because then and only then will the world fall away as meaningless and poverty or prosperity become one and the same: A servant with this clause Makes drudgerie divine: Who sweeps a room, as for thy laws, Makes that and th’action fine. This is not respectable social ethics. The Elixir is a simple statement of love to the Person of God, and the consequence of the love. Conscientious piety divorced from love has no reward. Love is the motivating agent in the elixir, the remedy. He then breaks into another allusion when he describes this love: This is the famous stone That turneth all to gold: For that which God doth touch and own Cannot for lesse be told. This is an allusion to the philosopher’s stone, an imaginary stone, substance, or chemical preparation believed by alchemists to have the power of changing base metals into gold. But Herbert’s stone is no imaginary stone. It is the touch of God’s love that turns all into gold. Everything he touches must be given a value that is equivalent to turning everything to gold. For Herbert such a vision of God implies that his work in the world be the unceasing work of praise. Praise of God is a challenge to society and a reiteration that the life not turned to God is no life and that words not addressed to God are vain. Praising God is a duty, but a duty of love, not fear, which is unavoidable and in which there can be no such wish to avoid it. God is a loved Person, not an idea, and to praise his goodness is a work of gladness. This duty of worship, of praise, is the greatest fulfilment and the wealth of man. But creation also rejoices in the Creator. So Let all the world in ev’ry corner sing, My God and King sees the whole creation as one, and it sees the work as one. It is the praise for God, God the Creator, and my King, my Sovereign, him to whom I owe my duty and my worship. The chorus of praise unites heaven and earth, for the praise rises from the earth and reaches to heaven. But in all this worship and praise it is the heart that is of the highest importance. God, the Person, is Love, and each one of us, the person, returns the love of God with his own particular love. The love in the heart, the seat of God in each person, even as it may be the seat of sin. But above all, the heart Must bear the longest part. Let all the world in ev’ry corner sing My God and King. Arthur Middleton, the author of this text, is Rector of Boldon, Hon Canon of Durham and a Tutor at St Chad’s College. Thanks for lifting my heart with Herbert today.